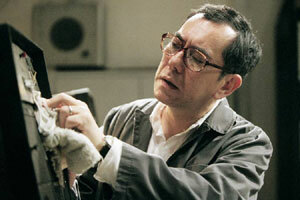 (left) Anthony Wong tends to a projector, and (right) Ronald Cheng and Karen Mok in Mr. Cinema. The Skinny: Entertaining, touching, and decidedly cursory. Mr. Cinema is an affectionate look at 40 years of Hong Kong history, but there are glaring historial and political omissions that could be viewed as weaknessess. Still, if one can look past that, what's left is still very charming, and recognizably Hong Kong. Director Samson Chiu returns to the Golden Chicken formula for Mr. Cinema, an affectionate look at forty years of Hong Kong history. Anthony Wong stars as Zhou Heung-Kong, a pro-communist leftist in Hong Kong whose life takes some affecting, though seldom surprising twists over the next forty years. An idealistic, China-loving fellow, Zhou (Which translates as "left", get it?) works as a projectionist in a local cinema specializing in Mainland fare. A massive fan of the movies from his motherland, Zhou seems to subscribe to the idealism presented in them, and lives his life with the same righteous code. "All for one, and one for all," is Zhou's rose-colored motto. Who wants to bet that he'll receive a rude awakening by the time 110 minutes is up? At first, Mr. Cinema seems to be treading the path towards that obvious bit of movie moralizing. Zhou is a caring father who clearly loves his wife Ying (Teresa Mo) and their son Chong, but his love for China may be greater. He's always willing to help others before his own family, especially his fellow leftists, as well as neighbors and friends, who he's not above lending - or giving - money to. Zhou's penchant for handing out cash isn't the best thing for his family, however. Their life is already quite austere, with the family's savings going towards the basics, plus the possibility of Zhou's long-desired journey to Tiananmen Square. But life in Hong Kong seems to require more than Zhou can provide; Chong naturally is attracted to Hong Kong's increasing materialism, and even Ying desires one day to own a private flat. The family currently lives on a cheap rooftop, and as the years pass and Hong Kong's fortunes rise, a steady stream of neighbors leaves the rooftop for a better life. But not Zhou, whose steadfastness to his values is as maddening as it is admirable. Chong grows up (as an adult, he's played by Ronald Cheng), and bemoans his poor education in a leftist school, as well as his lack of anything resembling upward mobility. His life becomes one of odd jobs and get-rich-quick schemes, many illustrating and even lampooning the fast-paced lives of working class Hong Kong residents. However, luck is an absent mistress for Chong; Zhou donates Chong's tuition money to a neighbor's son (Andrew Lin), and Chong keeps missing chances to connect with his childhood sweetheart Min (Karen Mok). Meanwhile, Zhou and Ying continue their austere existence, but as Hong Kong changes through the decades, Zhou never wavers from his faith in China, sacrificing attention to his family for loyalty to the party and his homeland. Life's hardships eventually take an irreversible toll on Zhou's family; once the trouble hits home, will Zhou finally renounce his leftist ways and realize China isn't all it's cracked up to be? Standard narrative expectations would insist that Zhou finally get with the program, wake up from his China-loving ways, and embrace a more pragmatic life. Generally, he should have put the needs of the few (Ying and Chong) over the needs of the many (China), and life as a card-carrying communist hasn't accomplished that. However, that message is something one might expect from a film that actually attempts some criticism of China, and that's not what Mr. Cinema is at all. Besides being a Mainland co-production, the film was produced and conceived as a commemoration of the 10th anniversary of the Hong Kong Handover. As such, its view of history is decidedly rose-colored, choosing to avoid potentially uncomfortable topics (the leftist riots of 1967 are covered only briefly, and China's lack of support for its Hong Kong-based loyalists is never addressed) for more general and less politically-inclined events. The Hong Kong Handover, Y2K, the Asian Financial Crisis, and SARS are some of those issues, and the film uses the events in a canny manner, sometimes with humor, but never without humanity. Mr. Cinema eschews criticism for the inspirational, choosing to portray Hong Kong people as troopers who brave hardship, if not willingly then readily. Mr. Cinema is an affectionate film rather than a nostalgic one. Never does the film truly portray the past as better, opting instead to use Hong Kong's hardships as a way to demonstrate its people's humanity and resolve. It's a nice sentiment, and Samson Chiu handles the material well, never overdoing the comedy, while also earning the drama. Unlike the Golden Chicken films, the focus here is on a handful of characters, with no deviations for distracting star cameos. Chiu's characters are identifiable and even admirable, and the actors go a long way towards making them worth caring about. Zhou could be seen as a bit of a buffoon, but Anthony Wong gives him integrity and humanity. Teresa Mo is equally good as Ying, and the supporting cast (John Sham, Bau Hei-Jing, and Karen Mok) shore up their parts nicely. Most surprising, however, is Ronald Cheng, who frequently overdoes Chong's bluster, but does so with an underlying emotion that works wonders. Many of the film's key relationships hinge on Chong, be it his relationship with his father, or his long-gestating romance with Min. Cheng imbues Chong with a basic sympathy, and nails his emotional scenes with surprising facility. For quality performances, Mr. Cinema provides some of 2007's best. However - and this is a very big however - Mr. Cinema is very guilty of something that we'll call "selective history". Generally, the film portrays history accurately, using it as a way to define its characters and their growth. However, one event that greatly affected Hong Kong goes suspiciously unmentioned: the Tiananmen Square Massacre of 1989. The reason for the omission is obvious; after all, this is a film meant to celebrate the Hong Kong-China reunion, and nearly twenty years later Tiananmen Square is still a touchy subject in the Mainland. The censors can breathe easy; in Mr. Cinema, the event is ignored, and judging by character reaction, may never have taken place at all. That's a bit of a problem. Given Zhou's ardent desire to visit Tiananmen, and the film's running joke of how he never finds the chance to visit, the omission comes off as a disservice. Frankly, to gain a complete portrait of Zhou Heung-Kong and his family, Tiananmen Square needs to be there. We're getting a deliberately watered down history in Mr. Cinema; the Hong Kong on display is more than just rose-colored - it may be willingly blind.